The 530 Bride offers creative and affordable wedding planning services and our blog brings you up-to-date events, wedding inspiration and trends! We always recommend hiring a professional when it comes to weddings & events so that you can trust that it will be done right the first time. If you are a bride looking for creative stationary and custom wedding collateral, you definitely need to head over to The Idea Emporium for inspiration. If you are Maid of Honor trying to be the hostess with the mostess on a budget, these free printables are for you. Word of advice, printing from home may have its challenges and may not turn out as desired. Try these out ahead of time, so that if you aren't happy with them you will still have time to contact a professional. Photobooth Props - Six Months to Mrs.
Just remember, for the best results contact a professional rather than printing from home. Have You Branded Your Wedding Yet? The days of having to trying to piece together corresponding wedding items that match your color and style are coming to an end. In comes the trend of branding your event so that the design is exclusively yours while keeping things cohesive across the board. If you are unfamiliar with this trend, you are in for a treat because we have invited our local branding expert Carey Galliani from The Idea Emporium to "school us" on what it all means! How did branding become a trend in weddings? Like most traditions, weddings have evolved over the years. When our grandmothers got married they wore white dresses and carried flowers and were in love. When our mothers got married they took those customs and added some personality in the form of a set of colors that would make appearances throughout the celebration. When our sisters got married the wedding environment changed once again with the popular addition of a theme or motif (if you’ve attended a wedding in the last year odds are pretty good it featured purple, mason jars, burlap or peacock feathers- the largest trends of 2012). And now we stand on the precipice of the next big thing to introduce itself into the wedding world…event branding. Okay, what is branding exactly? Branding in the business world is a term you may already be familiar with. It’s the biggest ambassador of a business, more than a logo it’s the face of a company. A well-rounded brand includes at least one logo, a carefully crafted color palette and specifically outlined typefaces (or fonts) all of which used together create the brand. Each piece of collateral produced for the company (product, promotional pieces, business cards, packaging, etc.) features the company’s “face”. So how does this apply to your wedding? What does it mean to brand a wedding? As any bride or groom can tell you there are a million tiny pieces that go into a wedding. The big stuff you’ve been warned about; the flowers, the linens, the rentals… but what about the tiny touches? This is where custom event branding can take your wedding to the next level. Event branding ensures that all of the bits and pieces, from the table numbers to the thank you cards and from the invitation to the cocktail napkins & matchbooks are cohesive, impressive, and most importantly say something about you. How do couples get started? Branding your wedding is a two-step process; the creation of the brand and the creation of the wedding pieces that utilize that brand. Just like a company, your brand will include a color palette (good news…you can have more than 2 colors), logo and typefaces. It will also feature a monogram for you and your future spouse and graphic patterns to compliment the look. 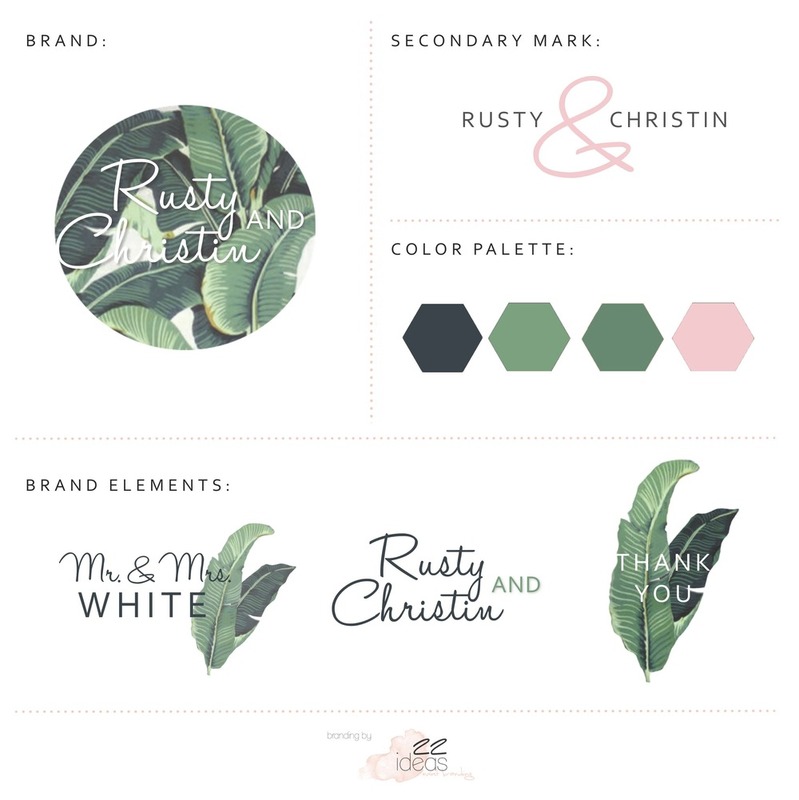 What does wedding branding look like? Here are a few examples of a brand board for a couple that outlines their patterns, color palette, logo/mongram & typography or fonts, etc. 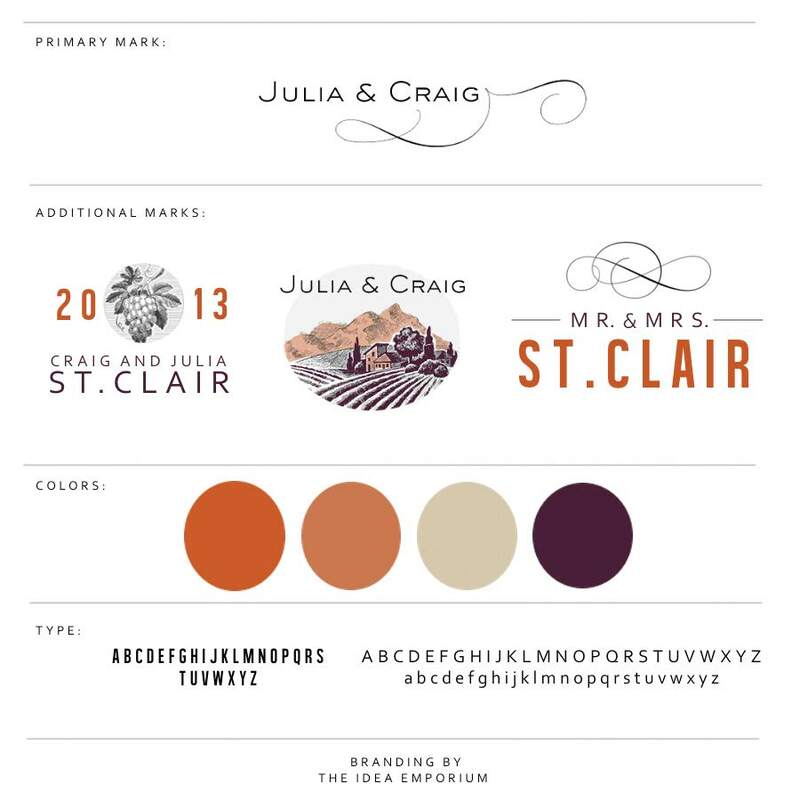 Brand Board Example #3 Your wedding logo may make its appearance on your invitation, welcome signage and ceremony program. Whereas the monogram will make its way onto things like menus, favor packaging. The patterns and graphic elements designed within your brand are great for items like envelope liners and table runners. These are also perfect for party favors. Lets face it, a shot glass with your name on it is cute, but a shot glass in mint and white stripes with the white peony printed on it is something a guest will truly want to keep…which is the point of a favor anyway right? Long story short, if you want your wedding to be cohesive and riddled with perfectly harmonious details then event branding is the way to go. We always enjoy getting to mingle with brides and local vendors, so we couldn't miss The Bash event hosted by Carey of The Idea Emporium. The Bash featured Poise Photography, treats by Three Girls and a Kitchen & Lovely Layers, decor by The Idea Emporium & Eco Peach Events. Magik Entertainment DJ'd & Snapshots Photobooth's provided the props & booth for a good time! Here are a few snapshots from the ol' iPhone for those who missed it and we look forward to more out of the box events in the future! Welcome to The 530 Bride, our space for sharing wedding planning tips, local vendor resources, real weddings & everything in between. You can read more ABOUT US here! Want to submit a guest post or featured wedding? Contact us to get started. The 530 Bride offers creative and affordable wedding coordination in Northern California. If you are looking for a Wedding planner in Chico, contact us today for a free consultation.